The Sandia Solar Programs e-newsletter features highlights, key activities, events, and publications. News is also available on Sandia’s Energy and Climate website. We welcome your feedback. Please e-mail comments and suggestions to solar@sandia.gov. We hope you enjoy this valuable resource! Approximately 220 solar energy experts from more than 30 countries and four continents gathered in October at the headquarters of TÜV Rheinland in Cologne, Germany, to discuss and share predicting performance and monitoring output from solar photovoltaic (PV) systems. The two-day workshop was divided into six topical sessions exploring advances in solar resource assessment, effects of irradiance spectrum on PV performance, soiling losses, bifacial PV performance, modeling tools, and monitoring applications. This workshop is the fourth and largest in a series of workshops organized by the PV Performance Modeling Collaborative (PVPMC), a collaborative group started by Sandia National Laboratories in 2010 with the goal to advance the “state-of-the-art” in PV performance prediction. The PVPMC collects information from the community and shares it on the Web and in a set of open source code libraries in Matlab and Python. The next workshop is planned for May 2016 in Santa Clara, California. Details will be on the PVPMC website in early 2016. Sandia recently installed a bifacial solar photovoltaic (PV) system at the U.S. Department of Energy’s (DOE’s) New Mexico (NM) Regional Test Center (RTC). Bifacial PV technologies allow light to be harvested from both sides of a PV module and can result in significant energy gains. 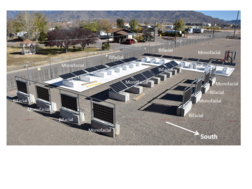 The system at the NM RTC is from Prism Solar and will be used for research to compare module-level performance on Prism’s bifacial PV modules to standard monofacial modules placed in the same orientation. Testing includes comparisons of performance at different tilt angles and orientations, as well as over highly reflective white ground surfaces. The purpose of this collaborative project is to validate Prism Solar’s design guide in various climates and sites. This guide quantifies bifacial energy gains as a function of array design parameters, such as tilt angle, module height, and ground surface albedo. Bifacial PV technologies may be especially suited for systems on white commercial roofs and other reflective surfaces where back side irradiance is higher.Similar test systems are planned for Vermont and Nevada RTCs. The DOE established five RTCs in New Mexico, Colorado, Florida, Nevada, and Vermont to independently validate new solar technologies in a range of climates and settings. Funded by DOE’s SunShot Initiative, the RTCs are part of a broad national effort to make solar energy cost-competitive with other forms of electricity by 2020. The SunShot Initiative also recently awarded funding for further investigation of bifacial PV technologies. The project is led by Sandia and also supports work at the National Renewable Energy Laboratory and the University of Iowa in the areas of module characterization standards and backside irradiance modeling using ray tracing methods. Through this project, Sandia will install more bifacial PV arrays in NM in the coming months and years. Sandia's concentrating solar power (CSP) team has demonstrated a durable, high performance heat pipe wick for dish engine applications operating at 800°C. Heat pipe receivers provide a thermal interface between the concentrated sunlight on a focusing dish system and the heat engine that converts the heat into electricity. Prior high performance heat pipes have had limited durability due to materials limitations at temperature. These systems require high peak fluxes as well as high total power throughput. 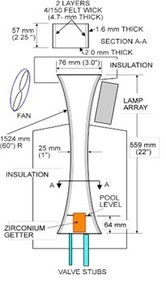 The heat pipe accomplishes high isothermal throughput through the evaporation of sodium from a wick (or sponge) lining the heat absorber surface. The vapor then condenses at the engine interface, much like a stovetop double boiler. A new heat pipe wick with a blended stainless steel fiber felt wick is under test, with 8000 hours of operation to date with no degradation in performance. Prior felt wicks structurally failed in less than 700 hours. The wick structure is periodically non-destructively evaluated with x-ray computed tomography. The lamp-heated test will continue in a test cell at the National Solar Thermal Test Facility at Sandia for at least 20,000 hours. Sandia researchers Jack Flicker and Jay Johnson, along with SunPower’s Mark Albers, contributed to an article in the November/December 2015 issue of Solar Pro magazine. “Resolving Fire Hazards from the Ground-Fault Detection Blind Spot” details how a current sense monitor, or CSM, can help prevent electrical fires through ground-fault detection. Traditional fuse-based ground-fault detector interrupters used in many central inverters are not capable of detecting a fault that allows a ground path for the DC electrical current to earth. This deficiency results in what is known as the ground-fault detection “blind spot.” A CSM uses a current transformer to detect ground faults and can sound an alarm when a fault is identified, thus reducing the chance of an electrical fire. The PV Value® tool was highlighted on EnergySage.com. PV Value ® was developed by Sandia and Energy Sense Finance, LLC, with funding provided by the U.S. Department of Energy’s SunShot Initiative Small Business Innovative Research program. The tool helps calculate the value of new or existing solar photovoltaic (PV) systems on residential and commercial rooftops. The EnergySage article discusses an example using PV Value® to estimate solar market values for homes in 15 cities across the United States. The authors found that solar photovoltaic systems add value to residential homes – in some cases, more value than the cost of the system new. PV Value is now being developed and maintained by Energy Sense Finance, LLC. In the Sept/October Sandia Solar Programs newsletter, affiliations were listed incorrectly for “Generic Wind Turbine Generator Models for WECC - A Second Status Report,” which was selected at the 2015 IEEE Power and Energy Society General Meeting as one of four “Best of the Best” papers. The correct affiliations should be Juan Sanchez-Gasca (General Electric), Abraham Ellis (Sandia), Pouyan Pourbeik (EPRI), Jay Senthil (Siemens), and James Weber (PowerWorld). Other Sandia PV Publications are available online.